The continually evolving Internet habits of just about everyone defy simple categorizations, as these two recent research releases show. The Pew Internet Research project reports that, of the 87% of teens who use the Internet, half are creating things online, like blogs, webpages, posting original artwork or stories on other sites. An amazing 38% of online teens read blogs. About one fifth report having a blog or a web page of their own. Older girls are more likely to have blogs. The teen trend is important because it suggests that this group will want to be more fully involved in collaboration to create products and services. They are also savvy to the ways of information technology, so their expectations for how well information should work will be high. If you want to engage teens, consider how to involve them in a collaborative, co-creative process. For adults, I see the streaming video as a desire to have denser, richer information that covers a lot of ground quickly, and doesn't require a lot of reading and clicking through. There is so much coming at people now, that communications which can be more friendly and engaging, more human, cut through the noise better. The interesting and informative television or radio advert is a medium this group has grown up with. Hardly surprising that they readily adopt it online. If you want to engage adults online, think about value added video and audio to enhance your message. Can you show instead of tell? 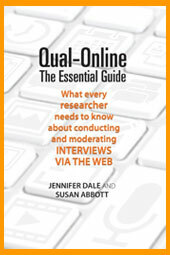 Centre for Media Research - love their research briefs. Easy sign up and subscription. When I worked in an big company, I used to look forward to Christmas week as a time to catch up, clean up, and do a few interesting things that had been put off for months. Is your website focused on you, or on your customers? Run your website through FutureNow's WeWe Calculator to find out how your web site language stacks up. For even more fun, compare with competitors. This is basic, isn't it? But it is surprising how often this basic rule is broken -- we need to talk to customers where they live, about issues that matter to them. It's everybody's station, WIIFM: What's In It For Me? I received a letter last week from CCH explaining their decision to rebrand around the global Wolters Kluwer name. They told me that e-mails are changing, so I can still get in touch with key contacts there. Nicely done. Many organizations would not have gone to the trouble. This approach really supports the brand positioning as an expert organization that can get ALL the details right. "The issue is the propriety of a government in a democracy suing a citizen for defamation arising out of criticisms that citizen may make of government conduct. . . . Legal actions of this kind are incompatible with a viable right to free speech." "You don't manage your reputation by taking your detractors to court -- you mediate, you hire public relations specialists if you need to, and you try to address the actual issue that caused the problem in the first place. Suing your citizens can only make you look mean-spirited and vindictive, even when the citizens are acting like jerks." One of Rogers' cell phone customers has been battling the company for some time now over a $12,000 bill incurred when she went travelling for a month and her phone was stolen. She claims their fraud detection software (some kind of neural network likely) would have red-flagged the activity, but that they didn't try to find her becuase her credit rating was good, and they felt confident of being able to collect. A slight miscalculation on the part of the company: the customer in question is a law professor. [Oops]. By the time this story hit the front page of the largest national newspaper on Saturday, it was also revealed that terrorists had cloned at least one executive telephone number before the company had converted to GSM security. The next day, we learn that legendary entrepreneur and executive Ted Rogers, one of the wealthiest people in the country, has personally apologized and wiped out the debt. He has also promised to have tea at the customer's house, no doubt so she can berate him in person. Good recovery, but how unnecessary. You don't have to be a football fan to get a lot out of this story from the New York Times Magazine about an unusual coach at Texas Tech that has taken a team full of B players and set records. Texas Tech can't attract the calibre of player that the elite schools can. So they can only win if they play a different kind of game, using a different strategy. They play a passing game, with more receivers than most teams. They spread out their offense so the Quarterback can see what's going on. They spend time on the field studying their opponent's reactions to various plays. Then they use that learning to advantage. If you run a business and you aren't the best funded, don't have the best locations, and aren't the market share leader, you'd better have a different plan than the big guy. Because you can only lose playing the big guy's game. This is a major strategy in negotiation, and clearly it works in football too. Don't accept the conventional wisdom about how to win -- change the game to your advantage. This is much easier said than done, of course. But you can do these things if you think carefully about your customers, the competitors, the dynamics of your market space, and your own areas of strength. 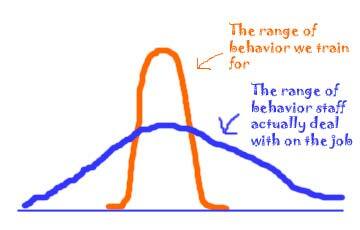 Can you design better products that make your competitor's distribution advantages irrelevant? Can you provide customized service that makes your competitor's pricing irrelevant? 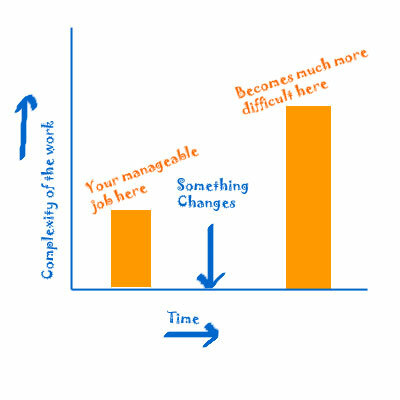 Managers act as if you need to give front line staff full latitude or no latitude, and often seem to ignore the middle ground. Coach Leach calls the main play, but the QB customizes it each time, based on what he sees happening in front of him. They don't have as many plays as other teams, but they customize them a lot based on local conditions. Players don't have to memorize a giant play-book -- they memorize the main formations, and the variations. When we limit the ability of staff to respond to what is in front of them, we reduce the chances that we will succeed. We also remove most of the fun and intrinsic rewards from the job. Have you found the balance between too much direction and not enough? 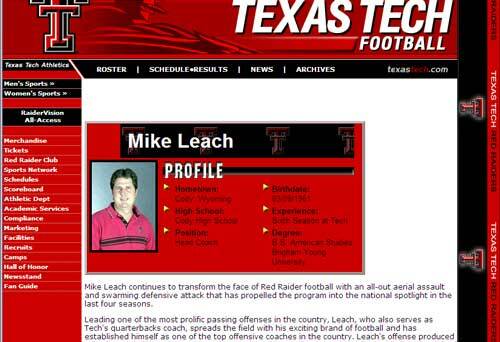 Leach played football only in high school. He studied law at Pepperdine. Then he decided he wanted to become a football coach. A lot of people in business excuse themselves from coaching because they don't think they are better at -- say selling -- than the people working for them. That's not what good coaching is all about. It's about observation, strategy, direction, focus and feedback. What are you saying to people at your daily huddles before the start of play? One - Do your job. DO - YOUR - JOB! Three - Your body is your sword. Swing your sword. SWING - YOUR - SWORD! The last bit comes from an ongoing pirate ship analogy that Leach has developed. The tempo thing is interesting too: Leach thinks that teams that are winning and teams that are losing fall off tempo and slow down. He thinks the team with the best tempo wins. When you are in a restaurant and the service is great, look around you at the wait staff. They are usually moving in a rapid motion ballet, scanning the room, bending around corners, everyone working at a high tempo together. A trading desk that's having a hot day on the markets looks just like this. Tempo counts. How's the tempo in your shop today? Is it a relationship or just a Rolodex? How do you define a relationship with a customer? Or a donor? Or a 'friend of the family'? This week brought a new request for fundraising support from a nearby naturopathic college. I get e-mails, phone calls, and even follow-up calls from these guys. They clearly think I have a relationship with them. Here's our history together: about 2 1/2 years ago this college asked us to submit a proposal on a research project. Since the proposal involved several different research elements with some specialized audiences, I asked another firm to co-present. This type of proposal involves several full days of work, including background research on the industry, structuring the problem, designing and costing an approach. We lost the bid, and were advised by fax of this news. [Not exactly a classy approach, but that's the RFP process for you]. When I called to follow-up and learn what factors influenced the decision, I was told that this information was not public and that no one would talk to me. But somehow, we made it on to a list of supporters, and they continue to think I might cut them a cheque. Of course this is non-sense, right? But we're all guilty. 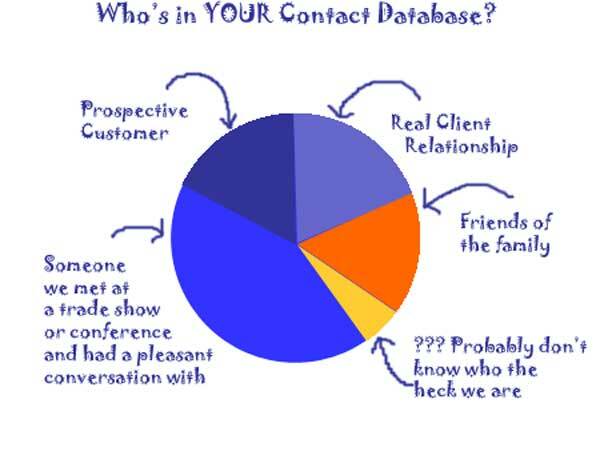 Who's in YOUR Contact Database? When I was assembling my Christmas greetings list this week, I realized there are quite a few names in my contact database for people who I don't know very well. A handful, I'm not even sure how we met. Some of these people probably don't know who I am either. When it comes right down to it, probably only a third of this contact list would be someone I could actually pen a personal note of greetings to. Another group don't really require a greeting of this type, because I talk to them all the time. And that leaves a whole list of people with a dubious connection. What the heck are they doing on my contact list??? It's complicated enough doing this as an individual or a small company, but much more difficult for my clients. Businesses usually try to define a relationship in terms of how much business a given customer brings to them, relative to other customers. Not a very customer-centric approach, but very common. Some try to define customer relationship based on what share of the customer's total business they have (share of wallet). Future potential may be a consideration. Other segment characteristics, such as life-stage, may be a consideration. 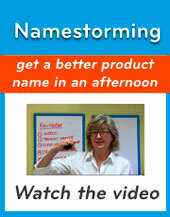 The whole effort is around designing business rules that can help define who is who, and who gets what kind of contact. If you read the literature for the CRM technology firms, they make this process sound straightforward. But the process of defining the business rules is usually a tough one. Just last week, someone at a client firm told me that a model they have been refining for two years "doesn't really have buy in yet". The reason it's tough to define rules for what contitutes a relationship is that it relates DIRECTLY to strategy. Business-to-business sales models often talk about leads versus opportunites, or suspects versus prospects, or qualified versus unqualified prospects. 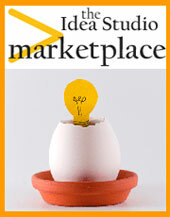 In the words of that famous sales trainer Steve Schiffman, opportunities without a next step amount to "bupkis". Another category that I often think about is what I call "friend of the family". This is a person or organization that may not be a customer, but is positively disposed towards helping you, perhaps due to some past relationship, or perhaps along the lines of a cross-referral relationship. I have a lot of people I think of as "friends of the family", and I count myself as one of these for many people and businesses. They aren't clients, and I don't expect them to be, but I think highly of them and would like to help them succeed. Don't assume that anyone else in your organization defines "customer relationship" the same way you do, unless you've actually talked about it at length and agreed on definitions. And then created the business rules to make those definitions work operationally. Actually getting clarity around this type of question can be a powerful driver of improved business results. You need a definition you can put on one sheet of paper, and explain to anyone who asks. Even better is if everyone in the organization can explain it to anyone who asks. Fortunately, it is a lot easier to help other people to address this kind of issue than to solve your own. [Shoemakers children and all that] We'd be happy to help you. And if you've got ideas for me, I'm all ears. We recently started running occassional pieces from a colleague of mine who is doing some extended first hand research as a part-time employee in a high-end food emporium. After hearing his stories over coffee, I encouraged X (who prefers to remain anon) to write them up. X has taken the plunge, and has his own space for his latest story, here. The latest tale involves a customer getting a bit too close to the help, and even moving behind the counter... worth a read, and I'm sure every word is true. My take on this is that the kind of training we offer staff deals with a relatively small range of behavior and preferences. X has earned his grey hairs, and I presume has a repertoire of skills to deal with most of what comes up in a typical day. But as he told me recently, "The young ones take some of the abuse pretty hard". In any event, if you are looking for a smile today, read the lastest rather steamy installment of X's adventures Acknowledged on Entry.